Together with Matt from YouTube channel MadMatt 4WD we are looking into types of batteries and multistage battery charging. So you did not touch your campervan or caravan the whole winter and now decided to go camping. Do you hold high hopes your battery will power your van’s lights for more than 10 minutes when you finally arrive to your campsite? If you are using an old charger your grandfather gave you, you can only guess if your battery is fully charged and if it is going to last you any longer. Let’s find out why you need to have a specific type of battery charger for your van and other vehicles of yours. We believe you need a charger that has a few smarts in it like BatteryCharge15 by BMPRO. There are several types of batteries widely used in vehicles. 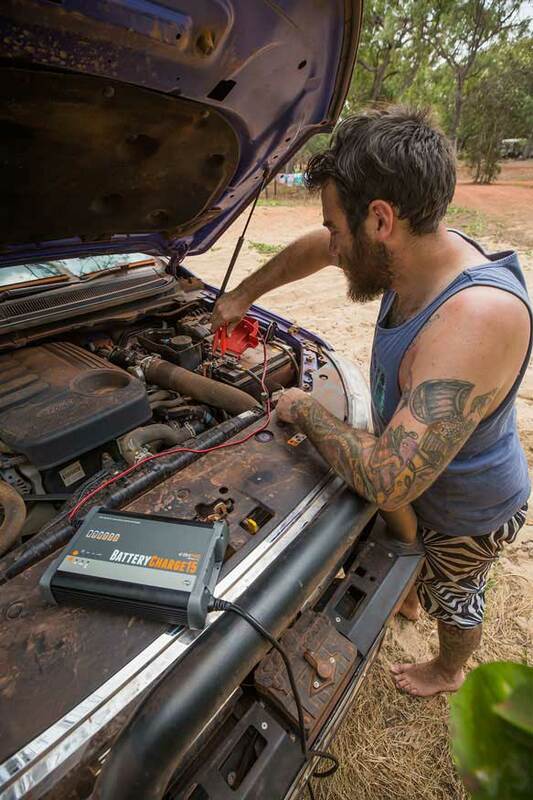 Lead acid batteries are the most common type of batteries that we’re going to find in four-wheel drives, caravans, camper trailers, motorhomes and basically any type of vehicle that uses a battery. In a lead acid battery, the electrodes and grids are made from lead, while the electrolyte is sulfuric acid. The most traditional is a standard wet cell or flooded, with this technology being around for ages. The user has access to the individual cells and can add distilled water as the battery dries out. All other types of lead-acid batteries are sealed and can be used in any type of configuration – upside down, on their side, under a vehicle. Gel battery has got a silica compound added into the electrolyte to make the liquid a jelly type. This type of batteries is highly resistant to vibrations. Calcium battery is another sealed wet cell battery. As you cannot top it up with water it is called maintenance-free. This battery claims improved resistance to corrosion, less water usage and lower self-discharge, but require a higher charge voltage compared with conventional batteries. While sealed, AGM battery is still a wet cell battery in which the electrolyte is suspended very close to the plate’s active material, making it more efficient. AGM is preferred when a high burst of amps may be required. They are the most popular batteries on the market. While they’ve got some great applications all different types of lead acid batteries have different charging requirements. On top of that, there’s also another type of battery, so-called Lithium Iron Phosphate battery (LiFePO4). They are more compact and weigh less, contain more usable energy, and have longer life cycle. Getting down in price, they have become a very viable option in many applications, from motorcycles to secondary caravan batteries. Lithium batteries have a different charging requirement as they have very different charging characteristics than that of lead acid batteries. 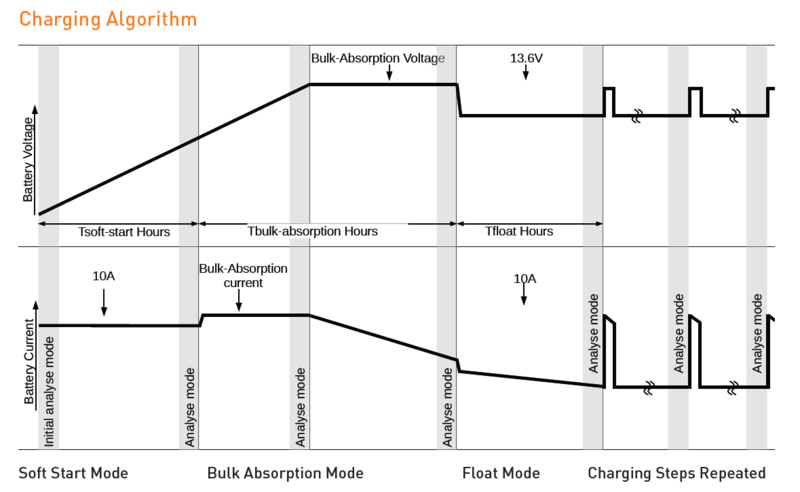 A battery charge cycle describes the voltage and current relationship in a charging battery, and depending on a type of a charger, has a number of charging stages. The first stage is desulfation. If the battery has been sitting around for an extremely long time in a discharged state those led sulphate crystals format on the plates of the battery and reduce its performance. Effectively we need to try to remove those led sulphate crystals. We’re going to use electricity to try and bust the crystals up and get them to re-energize and start to come back into cycling into the electrolyte. The second stage is a soft charge state. Just after we’ve punched the crystals we’re going to introduce the current at a slower level, hopefully not so shocking to the battery. The third stage is bulk charge. This is where we’re going to jam in about 80% of the power of this battery it’s going to have. The charger is going to input maximum amount of current into the battery until it reaches its terminal voltage. The next stage of charging is what’s known as the absorption phase. In this stage, the charger keeps the battery at its preset terminal voltage and slowly reduces the current so that the battery has the ability to absorb as much power as it can until it hopefully reaches its fully charged state. Then the charger goes into analysis mode where it looks at the battery and says: “Are you fully charged?” If the answer is “yes” then it goes into float mode and it just sits there keeping the battery fully charged so it’s ready to go whenever you need it. If the answer is “no, I’m not fully charged” then it goes into reconditioning mode. The charger just tries to recondition the battery a bit further and it basically cycles the voltage into the battery to do that reconditioning mode. Once it’s done that three times the charger analyses it again and either moves to the float mode if the battery is fully charged or shows up an error message. In the second case you know that you need to do something further with that battery. 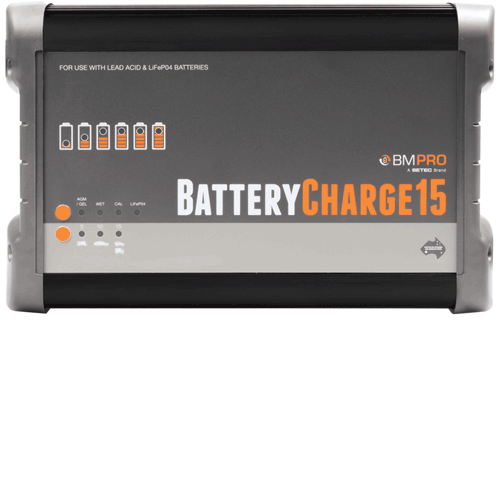 BatteryCharge15 manufactured in Australia by BMPRO is a comprehensive solution to some of the issues that we have with our battery maintenance. Firstly, you are able to set the mode of this charger specific to your battery chemistry, which is going to ensure that your battery is fully charged. It will maximize its lifespan which at the end of the day saves us all money. This intelligent charger is extremely easy to operate. You basically select your battery and your battery size using two buttons. LED lights indicate which type of battery is selected. You can use this charger on the smaller motorcycle batteries or your car batteries or your larger four-wheel-drive and truck batteries. This Battery Charger is really suited to all those applications and it could also be used as a power supply. BatteryCharge15 gives 10 amps at 13.6V and BC25 provides 20 amps at 13.6V – a decent power supply as well and a nice little feature to have within the unit. These charges are made in Melbourne here in Australia and that’s pretty uncommon to have things manufactured in Australia these days so that’s an awesome feature.